Hi, I am interested in your 1973 Ford Mustang (stock #4540-CHA) listed on Autotrader for $17,995. I'd like to get more information about this vehicle and confirm its availability. We all are all attracted to the 1973 Ford Mustang Mach 1 because its the finale for legendary first generation. And this one preserves that memory a little better than most. With the original paint, interior, and V8, this low-mileage fastback is exactly what you want in a time capsule car. Want documentation? This coupe has all the best with a Marti Report, original window sticker, and much more! With this kind of the historical significance, the factory-correct Golden Glow seems like a fitting way to close the book on the first-generation pony car. Its believed to be the original application from the factory. So while its not perfect, it does do a great job of showing off that worn-in personality that instantly lets people know you have a survivor car. 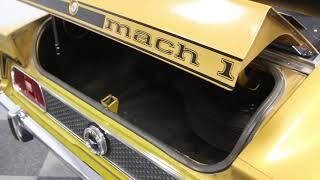 More than just history, you want this because its an aggressive-looking Mach 1 fastback. That means a blacked-out hood with NACA ducts, black stripe package, rear window slats, rear spoiler, and even an upgrade to a premium black vinyl roof. So this is the one that pleases the historians and the muscle car crowds all at once! Inside is more of the time capsule feeling. It starts with the ginger seats finished with cool ComfortWeave inserts. Its the kind of design that could only come from the 1970s, and so its great to still see them this complete today. All the other pieces from the carpets, to the dash pad, to the door panels all follow this earthy tone. So for those of you who want something else than muscle car black, this is a terrific way to stand out from the crowd. And because the Mach 1 was a premium package from Ford, you got plenty of wood inserts, which happen to follow this total color theme quite nicely. Plus, there are other great premium features, like the center console armrest and factory AM/FM stereo. But as a true drivers machine, you get the right features, too. This includes a rim-blow three-spoke sports steering wheel, and a full gauge panel with large speedo and tach. Under the hood is exactly what you want to see, a 351 cubic-inch Cleveland V8. And this H-code Mustang shows off its numbers-matching motor with great originality, right down to the bold blue valve covers and factory decals. You can see from the level of care and maintenance that this is a cherished Mach 1, and it has averaged less than 850 miles annually! Out on the road, this is a smooth cruiser as the V8 delivers plenty of power through the original FMX three-speed automatic transmission. Plus, with power steering, front disc brakes, and BF Goodrich T/As, this significant Stang is easy to show off anywhere. This fantastic survivor also comes with all the right paperwork. This includes copies of the following: window sticker, dealer invoice, bill of sale, title documentation, factory buildsheet, and Marti Report to verify it all. It also comes with a copy of the owners manual. So if youre looking for standout preservation on your classic, dont let this pony go into someone elses stable. Call now!